The Long Beach Airport (LGB) came into existence in 1923, making it Southern California’s oldest municipally owned airport. Since its birth, the airport has grown from an airfield with dirt runways to an award-winning facility that serves 3 million travelers a year with non-stop flights available to about a dozen US destinations. The Long Beach Airport (LGB) is one of five commercial airports serving the Los Angeles metropolitan area. 1 Long Beach Airport was amongst the 10 most beautiful airports in the world of a BBC list and in a Fodor’s Travel list of the top 10 airport terminals for 2014. 2 LGB is a small, user-friendly single terminal airport with two concourses: North and South Concourses. 3 Travelers can rest in an open atrium fully equipped with palm trees or enjoy bright and airy seating areas flanked by floor-to-ceiling windows that offer spectacular views of the sunsets. 4 The airport is well known for its Streamline Moderne architecture and the terminal, being a Cultural Heritage Landmark, is home to Alaska Airlines, Delta Airlines, JetBlue Airways, and US Airways. The Long Beach Airport (LGB) is a great hub for those visiting the Long Beach Convention Center, Disneyland Park & Resort, Orange County, and the neighboring cities such as Garden Grove, Carson, Huntington Beach, Irvine, and even Los Angeles. No doubt travel days are stressful and busy but Long Beach is close to Los Angeles and can help you avoid the stress of some of the busier nearby airports. Moreover, you can avoid some of the stress by scheduling your ride with RapidShuttle 247 who delivers services that are structured around your needs. Convenient and safe experience: RapidShuttle is always ready to serve the transportation needs of so many travelers that come in and out of the Los Beach Airport (LGB) 24 hours a day, 7 days a week. With a range of professional door-to-door shuttle services, RapidShuttle 247 guarantees a safe, convenient and fun riding experience with our friendly drivers. Parking is a concern: Although the LGB airport is not as busy as LAX airport, parking is still an issue which is occupied most of the time. We understand your need to reach the airport on time but finding a place to park your car is not as easy as it sounds. But no need to stress about getting early to the airport when a dedicated team of RapidShuttle 247 is available 24 hours a day, 7 days a week to coordinate your drop off to and from the airport in most comfortable and convenient transportation possible. Experienced and professional service: With more than 12798 successful airport pickups, RapidShuttle 247 is an industry leader in professional, courteous, affordable and private transportation services. Being picked up by RapidShuttle 247 is quite easy at LGB airport. 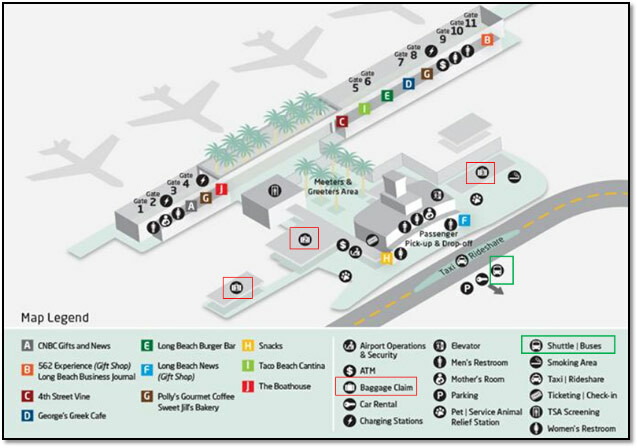 Once you gather your belongings, exit the roadway to door-to-door Shuttle Zone (white booth) next to the rental car area. Please contact our LGB Airport dispatch at +1 (888) 672-7438 and select option 2 or +1 (949) 667-2743 for further assistance. The LGB Airport dispatch will direct you to your RapidShuttle vehicle.